More than 70 officers signed the complaint alleging unfair promotional practices and unfair disciplining among white and minority officers. Prince George's County Police are forming a panel to review internal practices to ensure they are fair. ACLU says officers say public complaints against minority officers treated more harshly than complaints against white officers. Some officers say complaints about white officers are handled differently than complaints about officers of color in a Maryland police department, according to the American Civil Liberties Union. 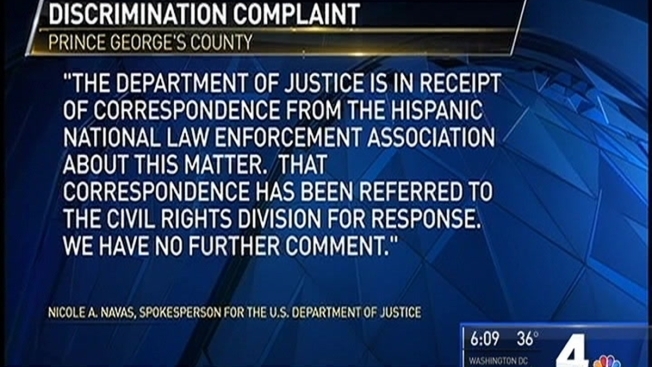 More officers signed on to a case of alleged discrimination in the Prince George’s County Police Department after News4 reported a complaint filed with the U.S. Department of Justice Thursday. “One particular concern that they raised is that complaints that are filed by the public against officers of color are actually being treated more harshly than complaints that are filed against white officers,” ACLU of Maryland Public Policy Director Toni Holness said. Some of the officers joining the case are retired while others have been fired by the Prince George’s County Police Department. “The fact that these officers are willing to be public with these allegations tells you the allegations must be pretty egregious,” Holness said. The ACLU is working with the officers who filed the complaint. “The concerns that were raised by the officers … reflect poorly on the department if they in fact turn out to be true,” Holness said. More than 70 officers signed on to the complaint alleging racial discrimination. The 300-page document was sent in October. A Department of Justice spokesman released a statement saying, "The Department of Justice is in receipt of correspondence from the Hispanic National Law Enforcement Association about this matter. That correspondence has been referred to the Civil Rights Division for response. We have no further comment." Police Chief Hank Stawinski announced Thursday he and the police union are creating a panel to review the department's internal policies to ensure. She said the panel was not in response to the complaint. Police officers will have an opportunity privately and publicly to voice concerns. The panel is expected to start its work almost immediately. The ACLU is pushing legislation in Maryland calling for more transparency and police investigations across the state. “If in fact the department is treating its officers fairly and handling its complaints appropriately, then if you make that transparent, the public can see that,” Holness said. It’s unknown if the Justice Department is investigating the complaint.